ARTIST IN RESIDENCE WITH INDIGENOUS PEOPLE? I talked to artist Barbara Navarro, who lives during winter with Yanomami communities in S. America, creating artworks that protest against the destruction of tropical forests and the degradation of the way of life of indigenous people. Barbara’s innovative art was originally inspired by staying with the Dogon people in W. Africa and later with the Yanomami. 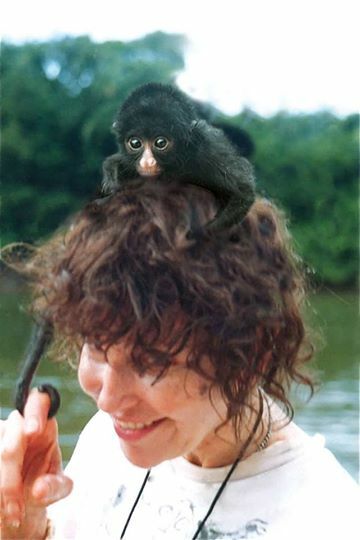 She has also written and illustrated children’s fantasy/adventure books about how Yanomami communities live and the magical connection they have with nature. Barbara has a BFA from San Francisco Art Institute and now lives, during the summer months, in Paris. Leslie: Can you tell the story, please, of the life experiences that led you to burn your sculptures as performance art? 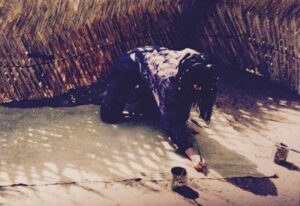 Barbara: An artist from the time I crawled, my artwork is my way of communicating. 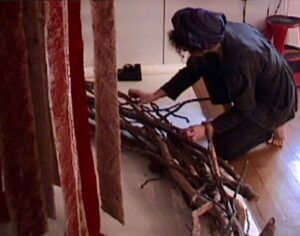 The idea of burning my totemic sculptures in public performances came to me in 2005 when I realized that the subtle evocations of the destruction of forests and the degradation of indigenous lives in my installations weren’t forceful enough. 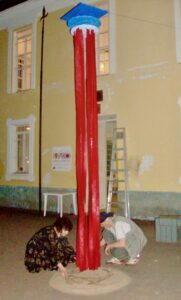 When I burned a sculpture in Paris in 2006 I felt that the flaming canvas strips were too close to the spectators and apologized afterward. When a response was, “We should be that acutely aware of Rainforest destruction,” I saw that I had found a way of communicating urgency. Leslie: Can you give a few examples, please, of what has inspired your best art, and the spiritual background to these artworks? 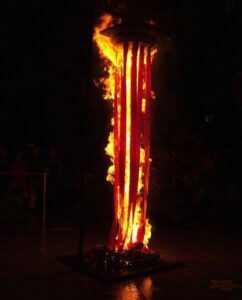 Barbara: I think the most powerful element of my art is the burning sculpture performance. The totemic sculptures are inspired by my sojourns with Yanomami communities in Venezuela and Brazil and my realization that their lives are endangered by gold miners, loggers and others who covet their ancestral territories and intend to destroy them in order to extract resources for profit. The upper horizontal upper part of the sculptures, superimposed canvases painted in acrylics, represent Yanomami cosmology; the parallel levels of the cosmos. The hanging bands, painted with oils which burn faster, represent the shamanic energies that resonate between the earth and the sky. Leslie: What’s been the impact on you and your art of exploring indigenous techniques and natural pigments, particularly in Africa? Barbara: Interested in natural pigments as a child, I collected leaves, berries and flowers in the fields and woods to make collages. My original question when I was in Mali with the Dogon people and elsewhere in Africa was “Why do people in subsistence societies spend so much time creating art?” My response is that it’s partially decorative but also devotional with magical intent. 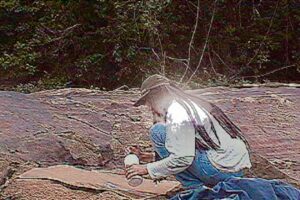 My artwork and my life have been transformed by my encounters with the Dogon and Yanomami peoples. Leslie: You’ve also written illustrated children’s books. Can you describe the fantasy and real aspects of them, please? Barbara: Living among the Yanomami inspired me to write a series of fantasy adventure books for children in English and translate them into French and Spanish. The real aspects describe the way of life of Yanomami communities and the extraordinary connection they have with the nature that surrounds them in the Amazon Rainforest. The fantasy aspect involves magical shamanic transformations and journeys of initiation. Leslie: In your children’s books, how did you work on the pictures? Are they illustrative or do they drive the narrative? Barbara: Both. The illustrations highlight elements of Yanomami community life and also pique the curiosity of the children and adults who are reading them: ‘what happens next?’ My favorite comment was one exclaiming that my books are page-turners. Leslie: Can you describe the individuals who have been your guides and helpers in understanding indigenous people and their cultures? Barbara: I’ve known and been encouraged by anthropologists, ethnologists and linguists in African and Amerindians studies. Their rigor and determination were the qualities that most impressed me and those that I strive to emulate and cultivate in myself. Leslie: What have you learned about the differences and similarities between the various indigenous cultures you’ve worked in and your own original Franco-American culture? Barbara: For me, the most essential characteristic of indigenous cultures is the way art infuses daily life: masks, ceremonial objects and ritual in Dogon communities and feather adornments, body painting and ritual in Yanomami communities. My original Franco-American culture designates some individuals as artists whereas, in indigenous societies, everyone involves in artistic pursuits without considering themselves ‘artists’. Leslie: What were the difficulties you experienced while adjusting to an indigenous lifestyle for many months in the year? Barbara: I was surprised to find myself feeling so much in my element and at home among indigenous communities and having more difficulty adjusting to my return to Paris. I missed living in community when I was back in the city where I noticed a certain superficial and frivolous quality to life. Leslie: Can you explain the difference between the Yanomami and occidental concepts of ‘art’? Barbara: There’s an occidental concept of art and artists that includes or excludes and judges the efforts of different individuals. The Yanomami only sketch on paper when I’m doing it and they never want to keep the drawings, only the colored pencils that children then use for drawing traditional designs on their bodies. The Yanomami all participate in artistic expression, body painting for feasts, war or mourning; the men painting on shamanic ritual implements or arrowheads and the women painting on baskets. Art is an evident part of Yanomami daily life and not an event separate from it. Next week author Kate Vane guest blogs about the power of crime fiction to question the controlling nature of institutions and explore people’s motivations. Previous PostMARJORIE MALLON AND THE GRASSHOPPER OF TIMENext PostWHAT’S SO GREAT ABOUT CRIME FICTION? It’s lovely to see this piece published, Leslie! Thank you so much for offering me a forum to express my views on art, life, and indigenous issues! The childrens books are a delight and her own sculptures and paintings are amazing. Thank you, Kathryn. It’s great that Barbara has your support. She’s an adventurous artist making passionate and important statements!